© V.Valenti/James Leslie Parker -- Kent Farrington and Uceko won Saturday night's $200,000 Gene Mische American Invitational at Raymond James Stadium in Tampa, Florida. Tampa, FL - April 9, 2011 - Kent Farrington piloted the gray warmblood Uceko to two clear rounds to win Saturday's $200,000 Gene Mische American Invitational, presented by G & C Farm, in Tampa, Florida. This was the 39th year for the Invitational, which was held at Tampa's famed Raymond James Stadium. It is the first that was held after the death of Gene Mische last year. Mische, the founder of Stadium Jumping, Inc., was the creator of the Invitational. This year the event attracted over 7,800 spectators. Farrington, of Greenwich, CT, took home $60,000 for the win. It was Farrington's first win at the Tampa event. Coming in second was Canada's Ian Miller riding Star Power. 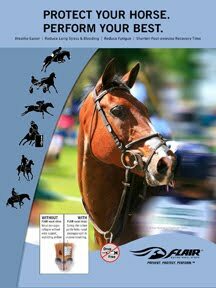 Miller, who won the event in 1992 with Big Ben, won $44,000 for his double clear ride on Saturday night. Both had two clear rounds, but Farrington's faster jump off time of 36.64 seconds gave him the victory over Miller, who took 41.72 seconds to clear the eight fence tiebreaker course. "I was really happy with my horse," Farrington said. "I knew I had to go really quick with these guys coming behind me, so it was a pretty impressive win for such a young horse." Farrington said Uceko, a 10-year-old Dutch bred, was injured last year and was given a long rest before being brought back to competition this year. "I'm thrilled. He's great," Farrington said. Also making the jump off were McLain Ward and Margie Engle. But each had a rail down in the jump off to finish with four faults each. Ward, riding Rothchild, came in third to win $26,000. Engle on Indigo, a gray warmblood, was fourth. She received a check for $16,000. Ward said he took his leg off Rothchild when headed into the first jump of a double combination on the short course. That, he said, may have cost him the rail. "It's not for lack of effort on Rothchild's part," Ward said. "I was thrilled with my horse." Miller said the Steve Stephens designed course was typical of past Invitational events. "As a designer, he believes in putting a lot of muscle in a course," Miller said. 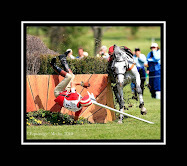 To get around the course, Miller said, a horse had to be brave and forward. The first round, with only four clear, proved the truth of Miller's statement. Farrington, Ward and Millar agreed that the Invitational is a special event. "It's a highly coveted event and it's good to have an Invitational win on one's resume," Ward said. "This is a class we all grew up wanting to win,"
Millar said the Invitational, which is in its 39th year, is a tradition for show jumpers. "For years," he said, "the winter show season was in Tampa, culminating in the Invitational." Farrington said he used to watch the Invitational as a child and had all the tapes available of the event. That way, he said, he had a chance to watch the famous riders like Millar and Michael Matz. "Winning it is an honor," he said. 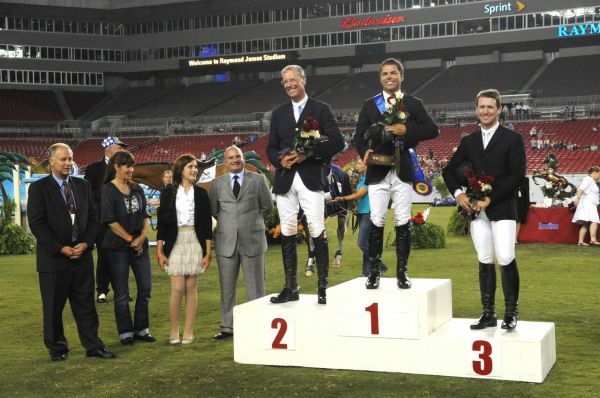 © V.Valenti/James Leslie Parker -- Kent Farrington, center is joined by second place finisher Ian Millar of Canada, left and McLain Ward, right for the presentation at Saturday night's American Invitational. Only six of the 29 riders went clear over the jumps, and two of those - Shane Sweetnam of Ireland and Schuyler Riley of Wellington, FL - missed their chance in the jump-off when they narrowly missed the 91 second time and got one time fault each. Close behind Sweetnam and Riley were several with only four and five faults: Christine McCrea, with Romantovich Take One, came in seventh followed in order by Beezie Madden and Mademoiselle and Mario Deslauriers riding Urico. All three had only one rail down. In 10th place was Ian Millar's daughter, Amy and her mount Costa Rica Z, and Katie Levy, the first to go in the class, came in 11th aboard Vent Du Nord. Both had five faults for a downed rail and a time penalty. 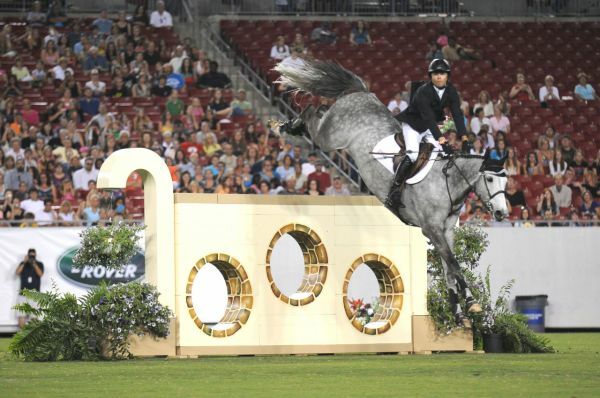 In 12th place was Aaron Vale and Quito, who had the best time of the riders who accumulated eight faults. Keean White of Canada, Candice King of Wellington, Andres Rodriguez of Venezuela, Gemma Paternoster of Great Britain and Georgina Bloomberg of New York voluntarily withdrew during the first round. And Lauren Hough was eliminated when Quick Study twice refused to jump a liverpool oxer.